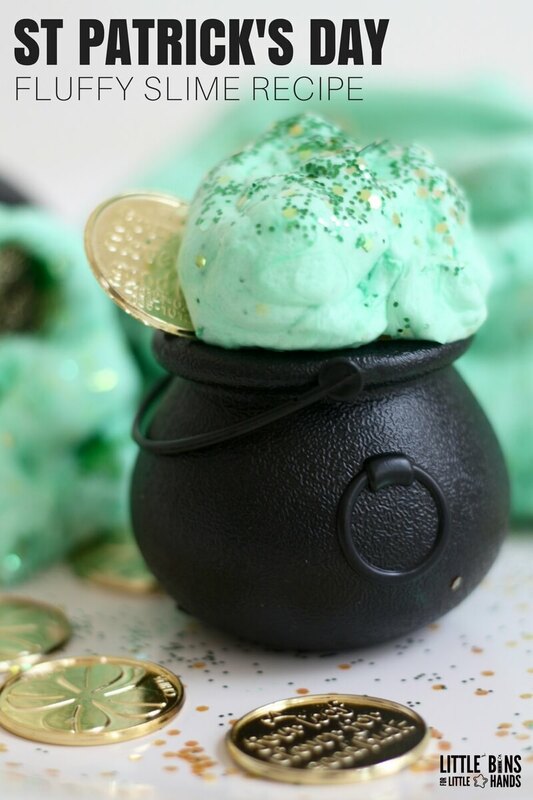 St Patrick’s Day Fluffy Slime Recipe for Kids! This lucky leprechaun got to make a fresh batch of our homemade fluffy slime this week! If you haven’t made fluffy slime then you are in for a real treat. If you have already made fluffy slime then you know how awesome homemade slime is! 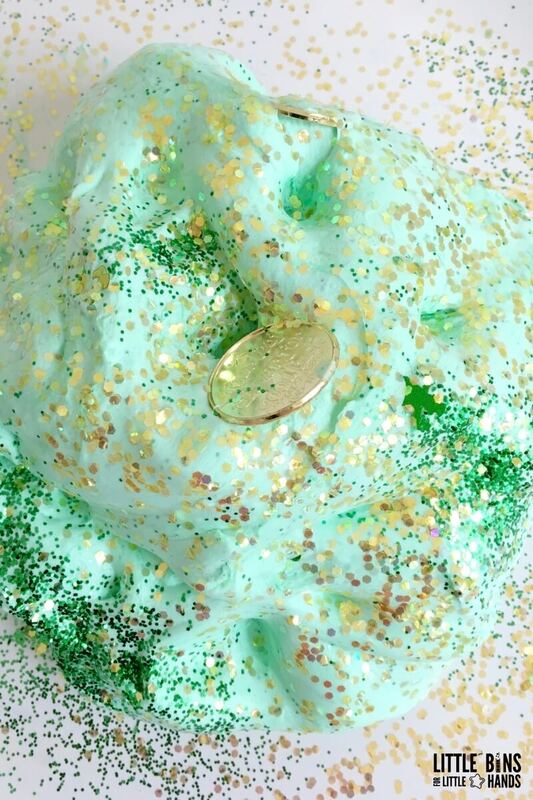 Today we bring you a brand new theme slime, a St Patrick’s Day fluffy slime recipe with glitter, leprechauns, gold coins, and more! AWESOME ST PATRICK’S DAY FLUFFY SLIME! Fluffy slime is an amazing texture that you have to try at least once. It starts out a bit messier than our other basic slime recipes, but the end result is fabulous! Mounds of fluffy shaving cream make for a light airy texture. However, just like our leprechauns on St Patrick’s Day, this slime won’t stay quite as fluffy for very long! All of our holiday, seasonal, and everyday slimes use one of five basic slime recipes that are super easy to make! We make slime all the time, and these have become our go-to favorite slime recipes! Here we use our Fluffy Slime recipe. This homemade slime recipes is one of our favorite sensory play recipes! We make it ALL the time because it is so quick and easy to whip up. Add color, glitter, sequins, and then you are done! 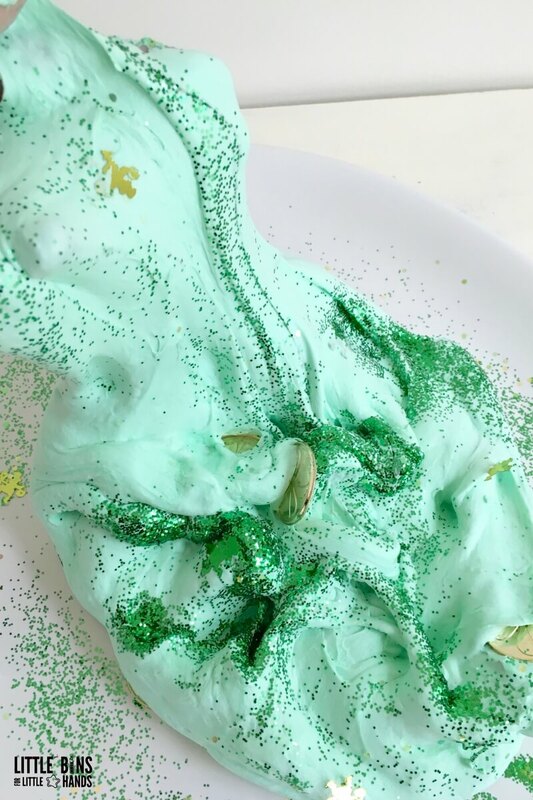 NOTE: You can absolutely make this St Patrick’s Day slime with any of our regular slime recipes if you don’t want to make fluffy slime. The look will be just as fun and you can substitute white glue for clear glue for more vivid colors. Regular saline solution slime, liquid starch slime, or borax slime recipes will all work wonderfully too! 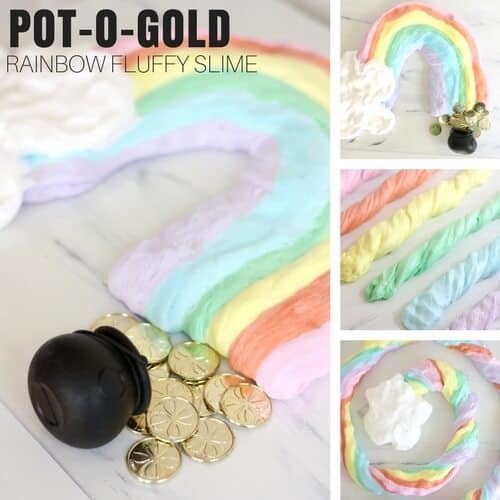 Why not make a St Patrick’s Day fluffy slime rainbow to go with a pot of gold too! 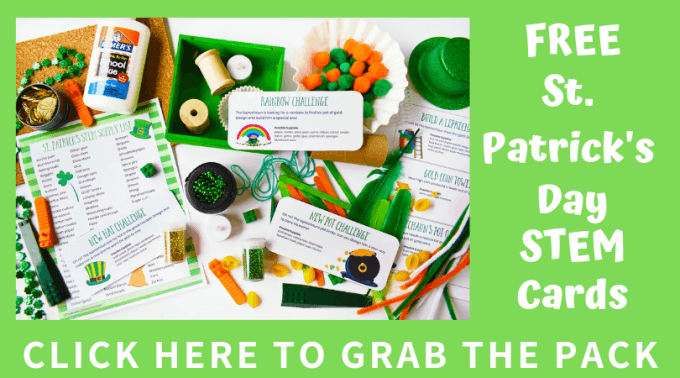 We always like to include a bit of homemade slime science around here, and that’s perfect for exploring chemistry with a St. Patrick’s Day theme. Slime is an excellent chemistry demonstration and kids love it too! Mixtures, substances, polymers, cross-linking, states of matter, elasticity, and viscosity are just a few of the science concepts that can be explored with homemade slime! Is slime a liquid or solid? We call it a Non-newtonian fluid because it’s a little bit of both! Read more about slime science here! We made our fluffy St. Patrick’s slime recipe with Elmer’s white washable school glue, shaving cream, and fun colors. Making this in the classroom or with a small group grab some small jars and pretty ribbon to send kids home with a fun treat! 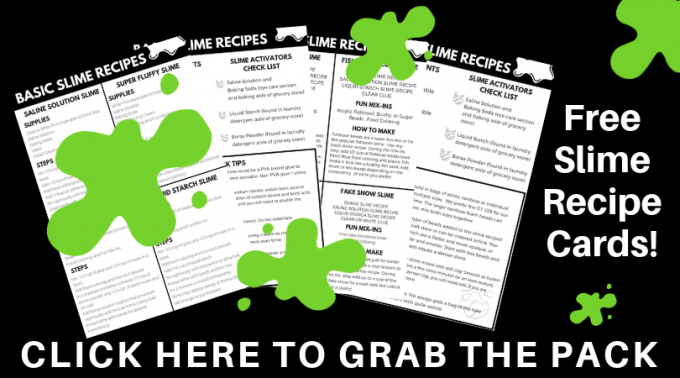 If you want to see what else you can mix into slime and how to make awesome slime ideas all year round, check out our Ultimate Slime Guide Book. As I mentioned above, this uses our fluffy basic slime recipe. Make sure to read through our SLIME SUPPLIES list to see what we like to use. STEP 1: Start by adding your shaving cream, glue and food coloring to a bowl. Remember, you want to make the more green food coloring you add, the deeper the green will be! You can also add in green glitter for a fun two toned look! STEP 2: Stir in the baking soda. STEP 3: Mix in your saline solution and stir until slime forms and pulls away from the sides of bowl. 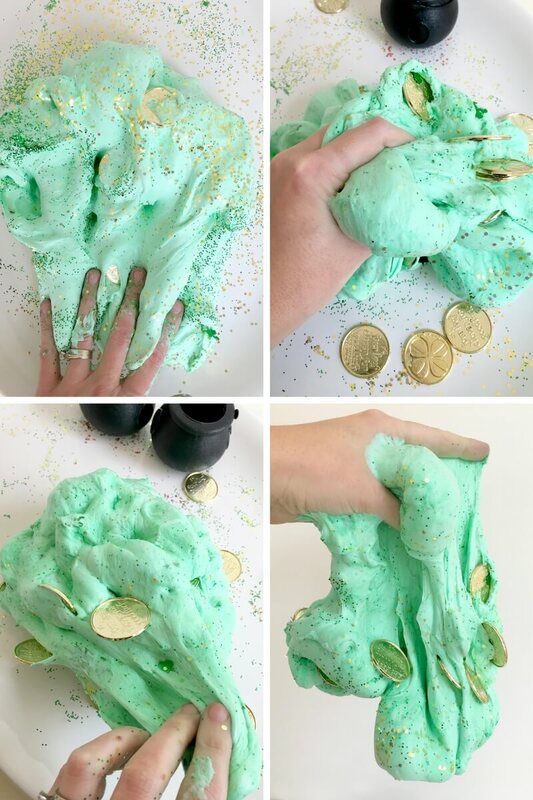 Jazz up your St. Patrick’s Day fluffy slime with gold coins and a plastic pot! Slime lasts quite a while! I get a lot of questions regarding how I store my slime. We use reusable containers in either plastic or glass. Make sure to keep your slime clean and it will last for several weeks. I love the deli style containers in my recommended slime supplies list here. 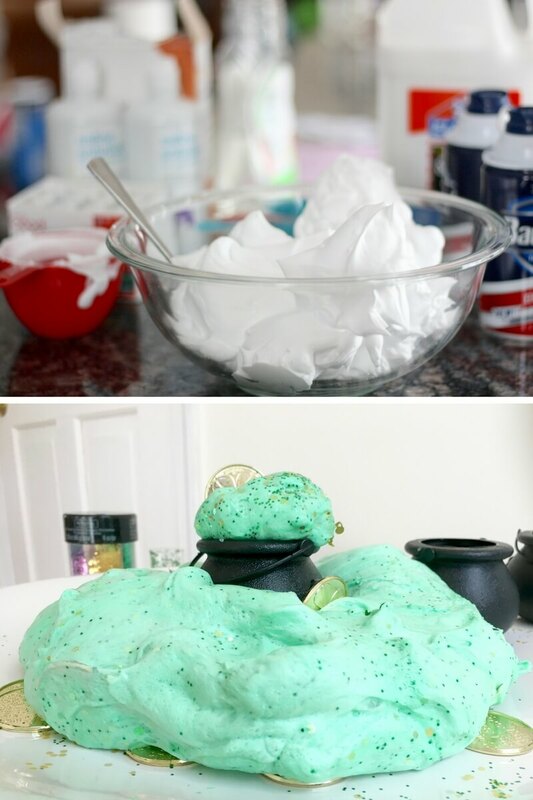 St. Patrick’s Day fluffy slime is a super fun slime recipe to make! ST PATRICK’S DAY FLUFFY SLIME IS JUST ONE OF OUR MANY ST PATRICK’S DAY ACTIVITIES! Check out more cool St Patrick’s Day activities by clicking on the link or the photo below!